static ENCF = "ERROR: no comment file"
static EFCS = "'EditFileComments' script"
static Off = "e:\Storage\Graphics\Icons\Visual Basic\MISC13.ICO"
static On = "e:\Storage\Graphics\Icons\Visual Basic\MISC14.ICO"
local Text = "List " ++ Counter ++ " files..."
Item = "Comment string is empty. Delete old comments?" One day it was required to edit descriptions for several files rather than for one. I was amazed to learn that Total Commander doesn't give such opportunity. I think it's an annoying defect, but it can be eliminated by means of PowerPro. The script is developed in such a way that if there is no group selected, then the cm_EditComment command is executed. Thus, it is a good idea to assign the Ctrl+Z hotkey to the script. If you will never have the necessity to edit many descriptions, you will not learn the difference between running the script and the command. But, if you ever have such need, I will be glad to help you with my script. Upper button informs about the total number of files selected (4 on the screenshot). After pressing the button the detailed information about files will be shown. Type the comment in the edit box below, or leave it empty. In the latter case the comments, if any, for selected files will be deleted after confirmation. Below you can choose where to put the new comment relative to the old one (if any) – before, after or instead (default). 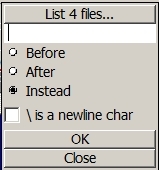 The "\ is a newline char" flag allows to set multiline comments. If this flag is set, then the backslash character in the comment body is treated as a newline character. One more function of the script – editing the comment for the whole directory. This comment is displayed in the popup window when hovering the mouse over the updir line (the ".." line on top of the file list). Total Commander does not provide any means to edit this comment. Moreover, this feature is undocumented. To edit directory comment, place cursor on updir and run the script. Of course, there will be no "List…" button in this dialog box.